I was really sad to see those who love anime watch and even share links of the pirated version of Dragon Ball Super Broly online. They are exchanging the links and even posting how happy they are to see their favorite characters in the movie. The question here is, is it proper to do it even if the movie is also available at your local cinema? What does it say about you and your passion for anime? Is it Right to Watch Pirated and Uploaded Streams? Way back 2002, there was no way to watch anime except through CDs that will be sent to you by a friend from abroad or to buy it from Japan. I for one are contented with watching anime on the television on primetime. Then came this shop which offers DVDs of your favorite anime. Since there is no other way to legally purchase it, I resulted to buying some titles through this option. Fast forward to the present time. Anime is available for legal viewing on streaming sites like Netflix and iFlix. Movies and live actions are regularly shown at Philippine Cinemas for about a minimum of Php300 per ticket. The sad truth is that despite of these legal availabilities, people and fans are still watching it illegally to anime online sites. These sites seem to support anime but in fact, they do not because they deprive its creators of the royalties they so deserve. By watching pirated links you are denying the creators, the staff and the studio a way to earn back on their investment. These people pay taxes, make jobs available and put time and effort to produce the anime you love. Then how would you give love back? By stealing a copy of the anime. 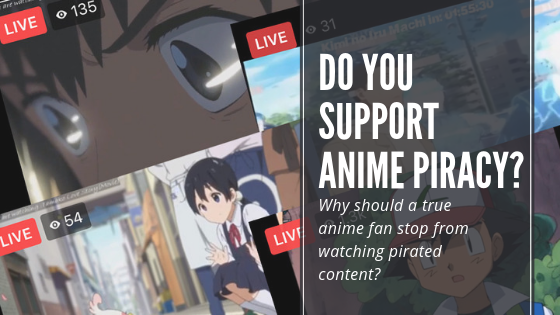 In general, IT IS NEVER RIGHT TO WATCH PIRATED ANIMES ONLINE. The fact is people watch because it is free. When something is free and readily available, why would you spend money anyway? Common reason of someone who watched anime on these streaming sites is the fact that it is either unavailable on the streaming sites or it is uploaded way before it was available locally. Seems legit right, but here is the thing, if you are an anime fan would you rather steal than actually give back to the anime you love? The conclusion is simple - IF YOU LOVE ANIME, WATCH LEGALLY!